This week's challenge over on Created By Hand and Quietfire Creations is "What's the Point" or "Rectangles/Squares" and I've got another Xmas card done. Yeah!! Slowly but surely wins the race. 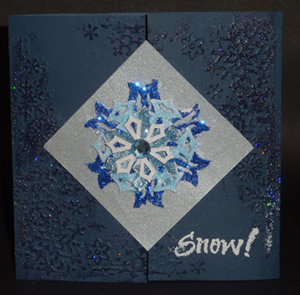 Anyway the card uses the latest Snowflake set from Spellbinders, a quote on the inside and the "Snow" word on the outside, both from Quietfire Design. To see more details and descriptions, just click on card image and enjoy. Lovely card and fold too! Hope you are feeling better.